What’s the Project? 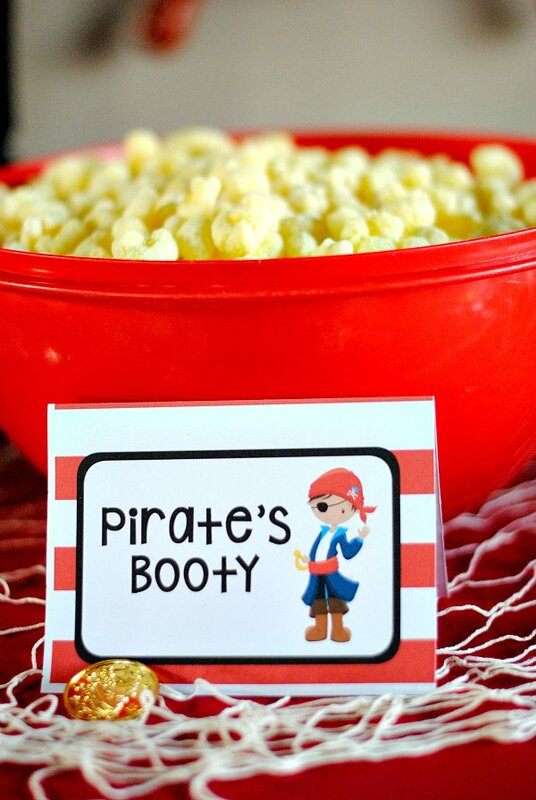 If you’re looking for fun pirate party ideas, these are super fun ones you are going to want try! 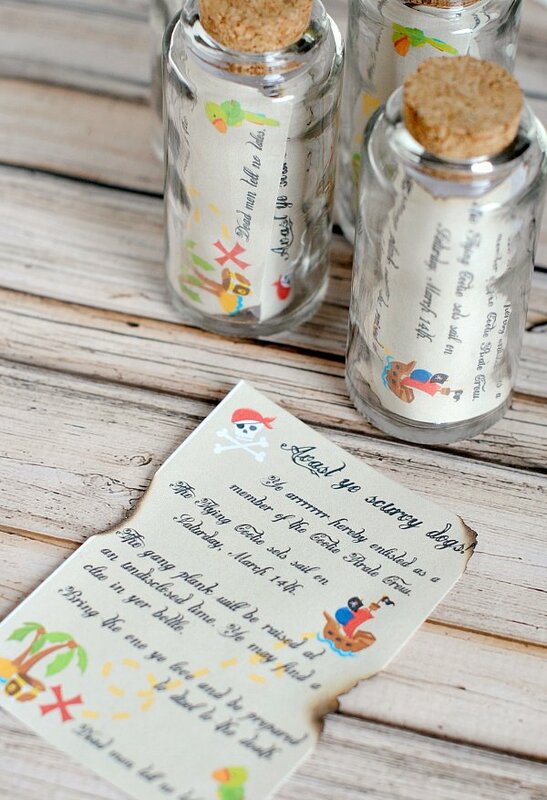 From pirate decorations to festive food, printable invitations and games, your pirate party will be a huge hit! About a month ago my husband and I threw what was maybe the biggest bash of our lives. We had a pirate party for our friends (no, not our kids’ friends, our friends). It was a ton of work, but also a complete blast. We had these adults running through the neighborhood searching for treasure, eating gold coins and acting like pirates. 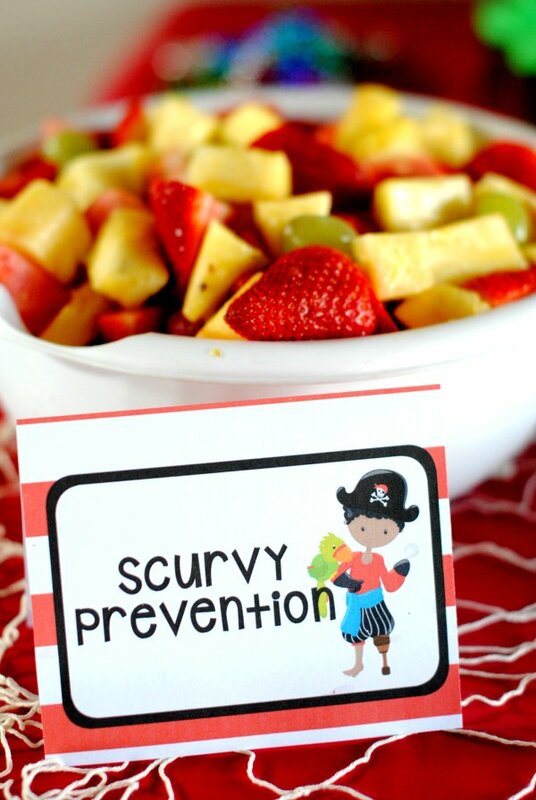 I am going to share tons of pirate party ideas today from the party we threw, because it was so much fun! 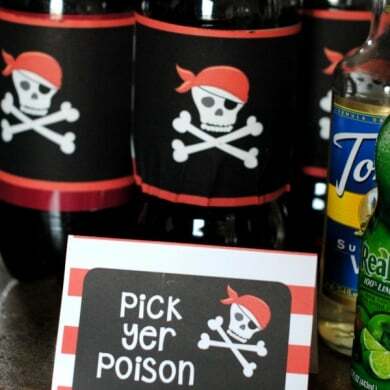 You’re going to want to throw a pirate party after this for sure-whether it’s for kids or adults or teens or whoever! 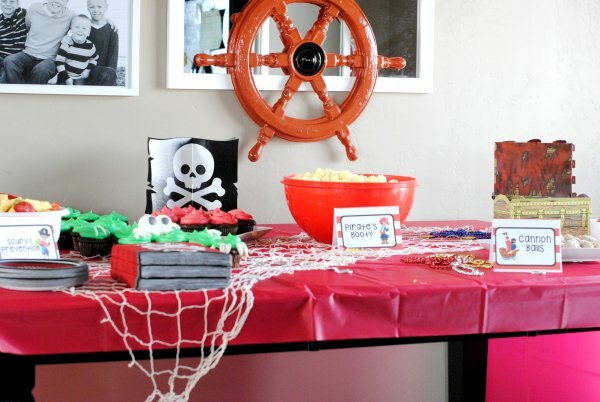 Everything is here for your pirate party, from invitations and decorations to food and game ideas. Some ideas are originals, others come from other sources on the internet. 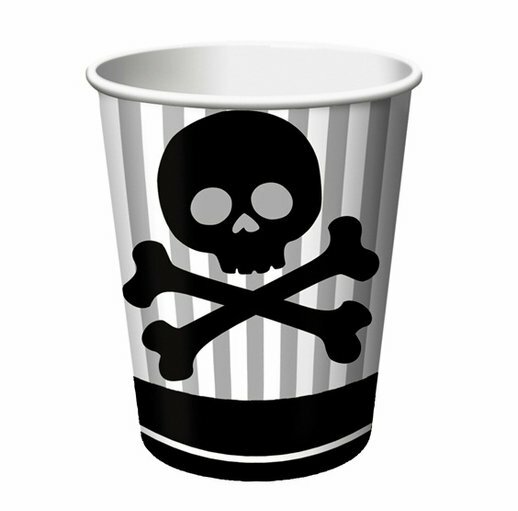 All in all, this will be a very comprehensive list of pirate party ideas and fun! Ok, me mateys! 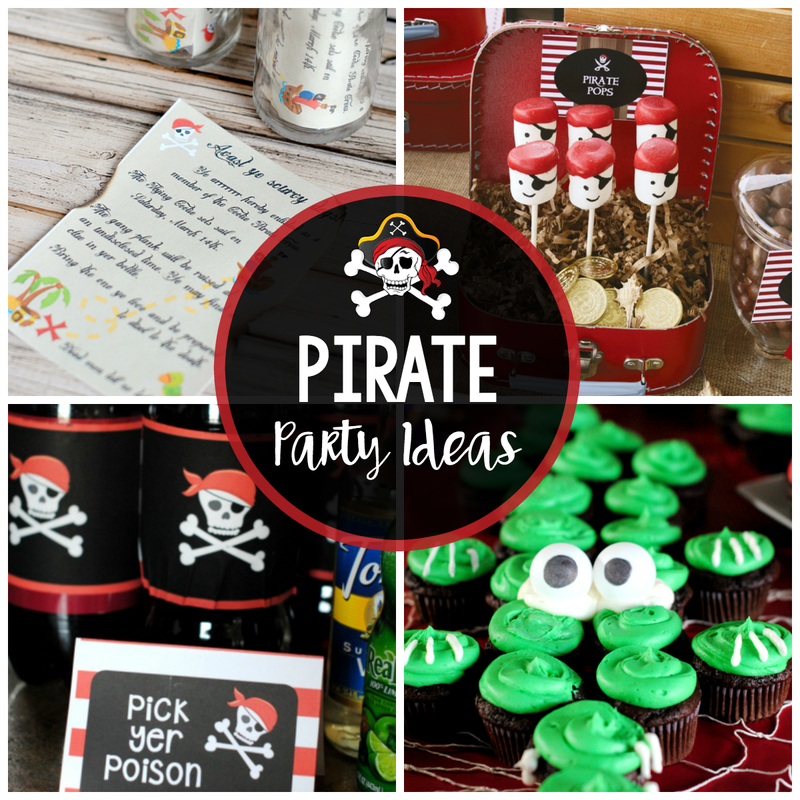 Get ready because you are about to get a huge amount of pirate party ideas for you to use to throw your own bash! Are ye’ ready for this? 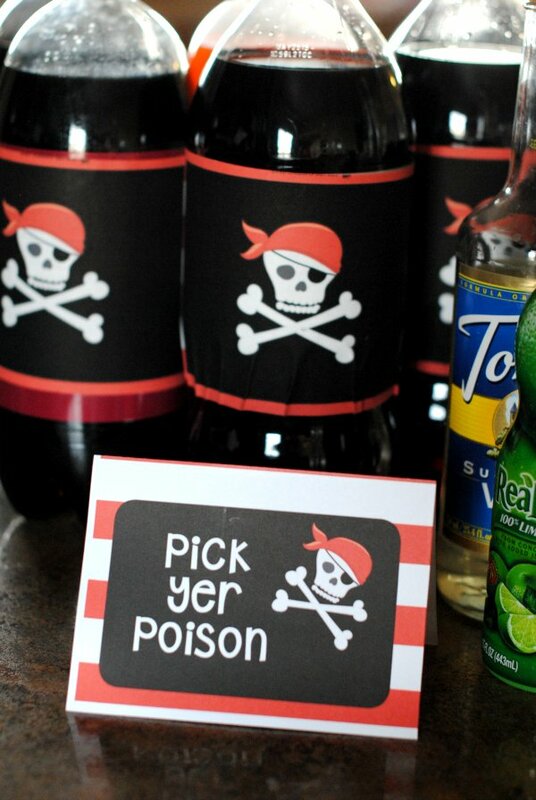 These pirate party invitations were maybe my favorite part of the whole party. I found little jars at a local party store that looked just right to be used for a message in a bottle. They even had little cork stoppers in the top! I created a treasure map looking invitation and then added all of the details. I printed these out and used a candle to burn around the edges a little, then rolled them and stuffed them into a bottle. Fun right? 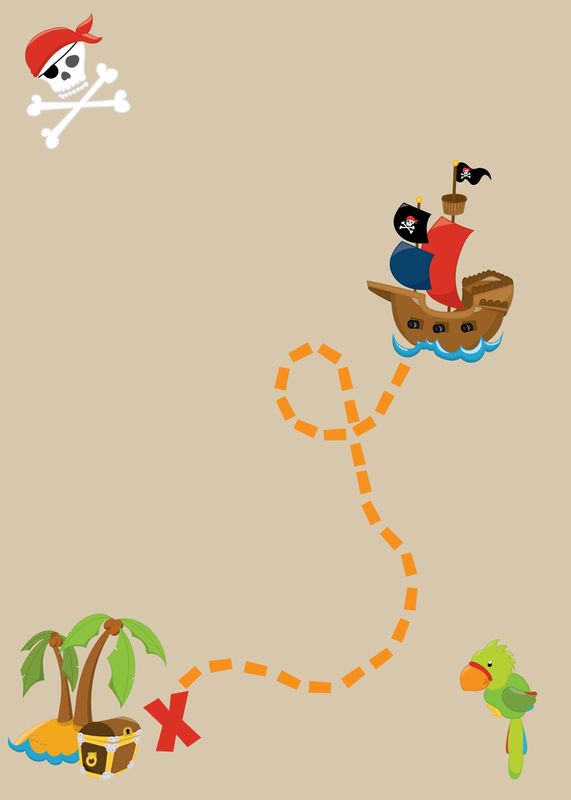 I have a template for this pirate party invitation that you can use to create your own if you would like. To use this, right click and save to your computer, then open in a photo editing program and add your text. 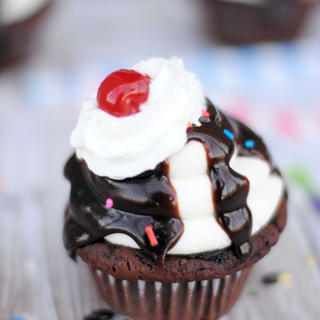 I use PicMonkey to do this and have a tutorial on how right here. 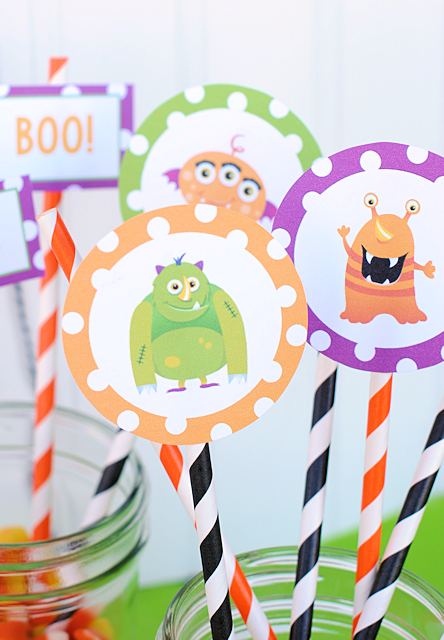 I seriously love those cute invitations! 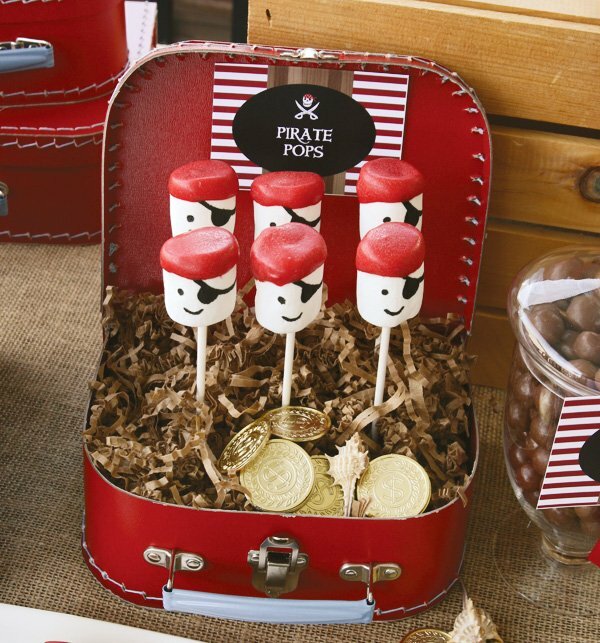 There are SO many fun pirate party food ideas to go with a pirate themed party. Let me show you some I used! Did you know that you can buy gold food spray paint? I love this stuff! 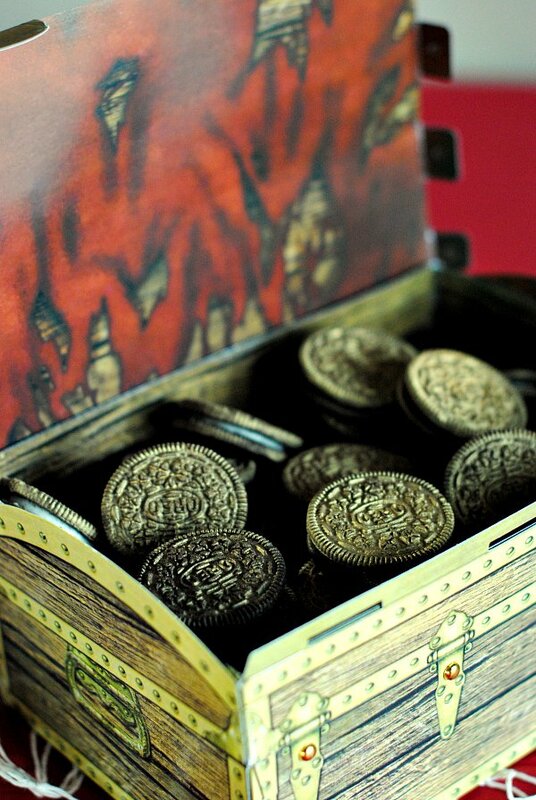 All you need to do is spray paint the Oreos to look like gold coins. They will still taste the same! And they look so cute! 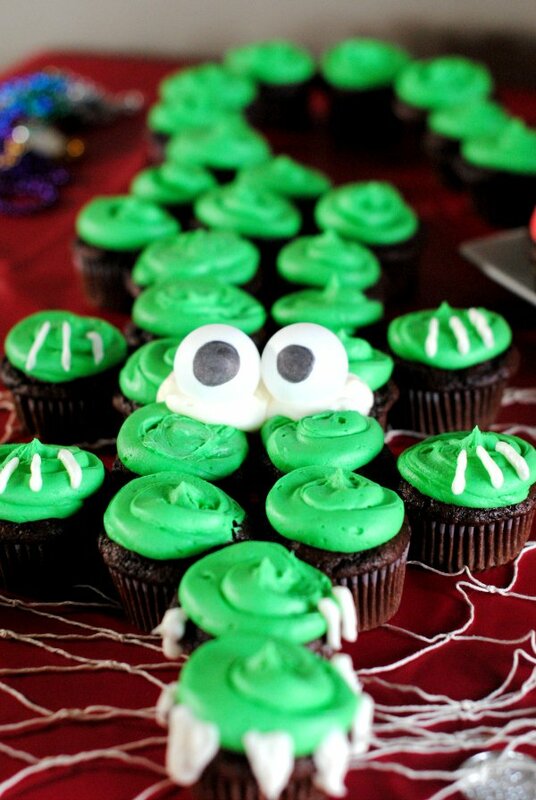 How about a crocodile made entirely of cupcakes? I got this idea on Pinterest as well, but again, I can’t find the source. If anyone has that please let me know! It’s fairly straight forward to make though. I used ping pong balls for the eyes. Just frost your cupcakes green, add some eyes and maybe claws and you’re all set! 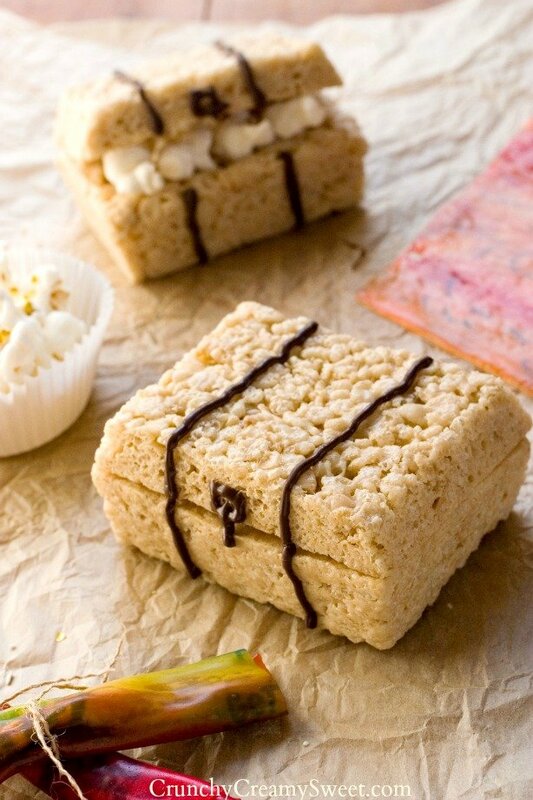 Love this idea of little Rice Krispy treat treasure chests. Get the tutorial here. Or how about some cute little Marshmallow Pirates? Tutorial here. See more about this set (it includes over 30 printable graphics that you can personalize as needed) and purchase it here. A fishing net to drape across the table and a ship wheel to hand above the table. We played several games at our pirate party. Roll the eyeballs into a treasure chest. 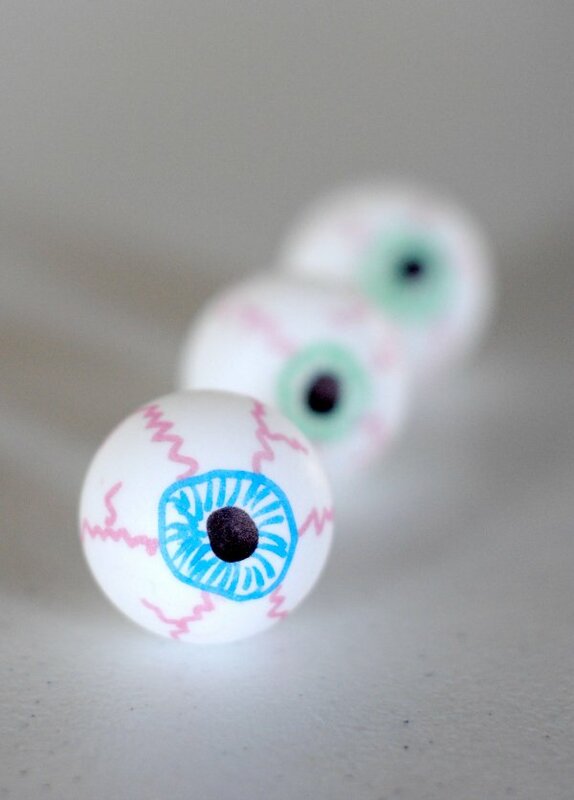 To do this we just got some ping pong balls and colored them to look like eyes. Then each player had the chance to roll them into a small toy treasure chest from behind a certain line. And last, we did a treasure hunt. We wrote our clues on the back of a treasure map that was cut into pieces. Since we had adults, ours took them around the city. If you have kids at your party you can just do it around the house. 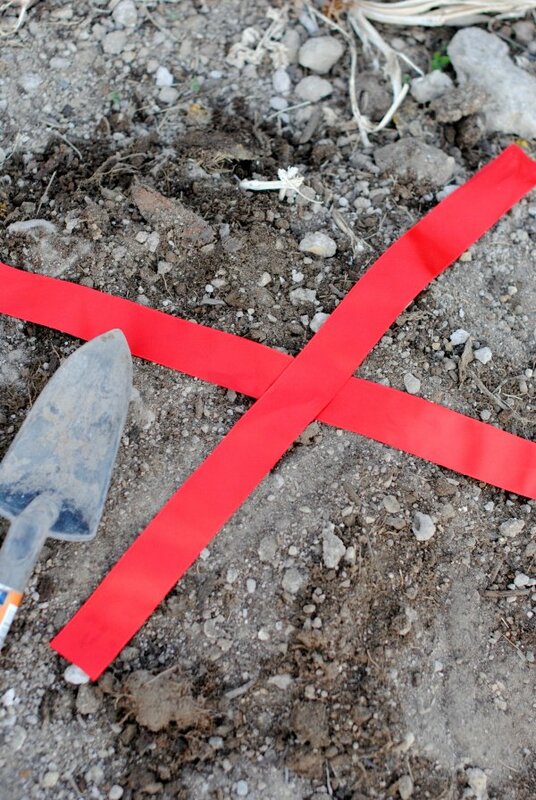 Ours ended with buried treasure that was marked with a red X to mark the spot. 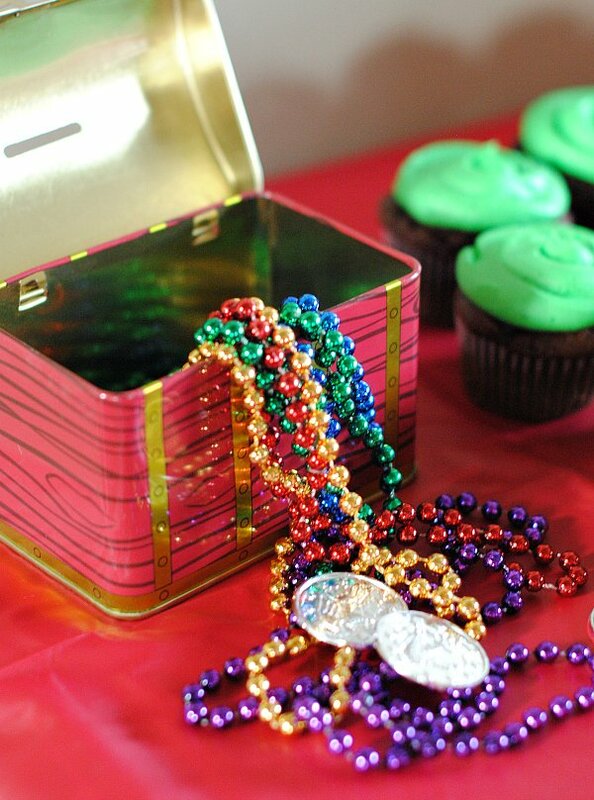 Seriously this party was so much fun and I hope you can use these pirate party ideas to throw your own fabulous bash! Good idea !! I really, really love it !! I love that you created that for YOUR friends. Haha! You guys are way too much fun! What was the occasion? Wish we could have come!! 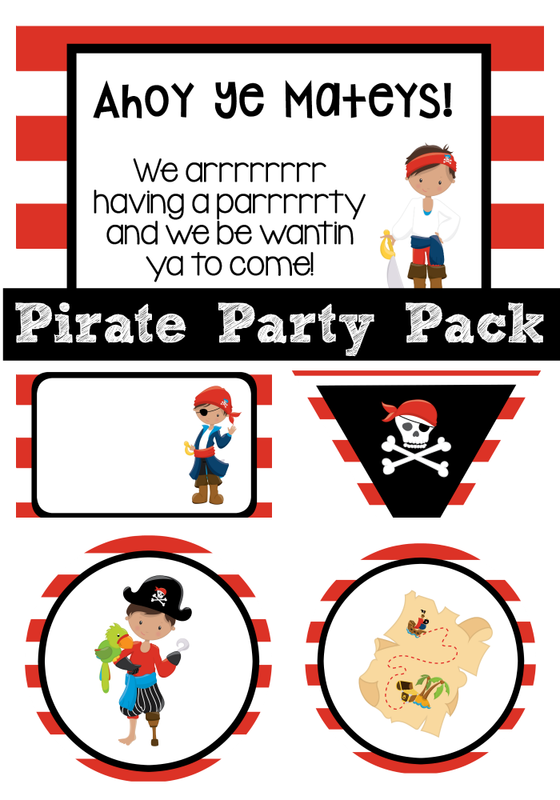 I clicked on the Pirate Party Printables pack and it led to an error. FYI. This is secretly my birthday party each year. We just don’t mention that it’s a birthday party. Of course by now they have mostly figured it out. We do it every year and there’s more to it than this. I will have to tell you about it. SO MUCH FUN! This is fantastic! Do u have the answers to the crossword though please? 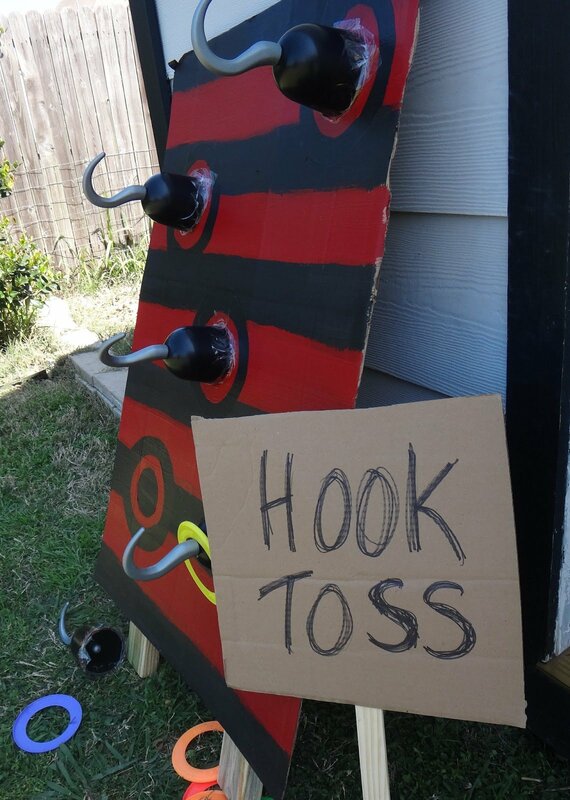 Awesome party idea! I love the gold oreo cookies. 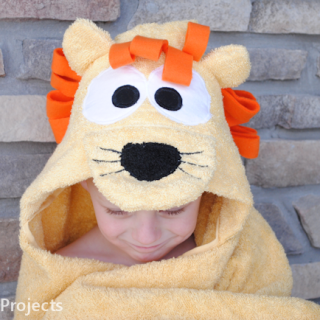 Hopefully one of my boys will want to do this! 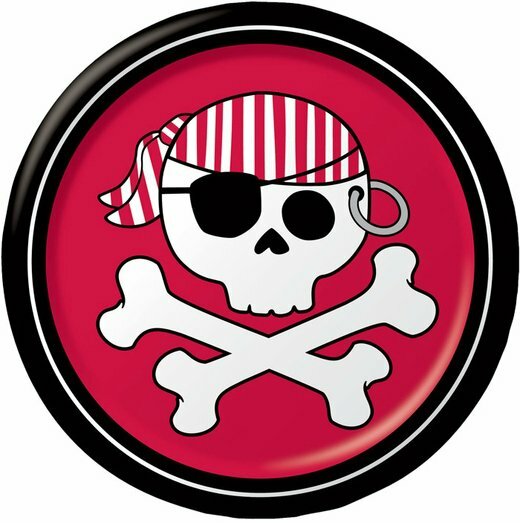 Sept 19 is International Talk Like A Pirate Day and our first small Pirate Party years ago is now something a little more…fanatical. Our friends have embraced it (they introduced mandatory costumes) and we rotate the hosts each year. Next year is our turn and your blog has opened my eyes to a number of possibilities. Why did I never think to look at children’s parties as inspiration? Thanks for the posts! 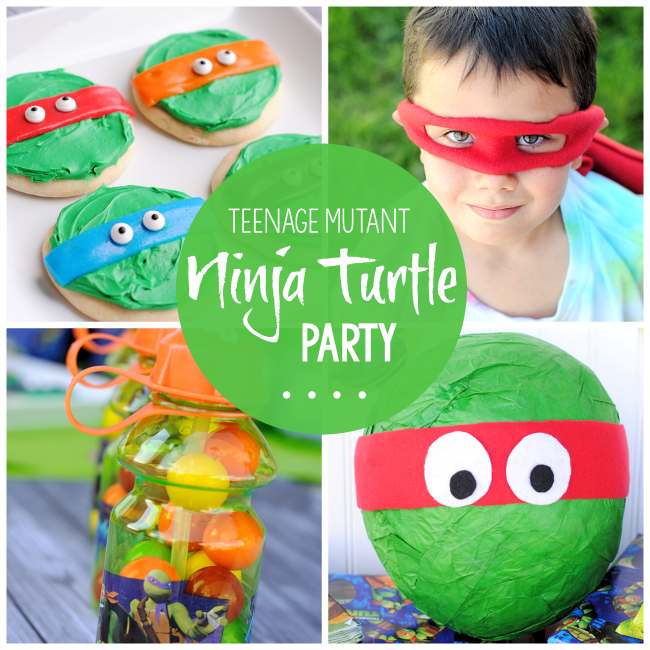 This party is adorable, so many great ideas, love all the treasure maps and your pirate printables! I can't see the whole invitation. Can you please tell us what it says? I love the clevding. What is a "gang plank" and what kind of clue did you include with the invitation? I am so enthralled by this idea! Gang plank is the thing they would make people walk and fall into the water. The invitation had the time and date in secret lettering (lemon juice). I think the rest of it says Bring the One you love and be prepared to duel to the death.